Congratulations! AshLee Frazier married to boyfrined Aaron Williams! Home / Celebrity News / Congratulations! 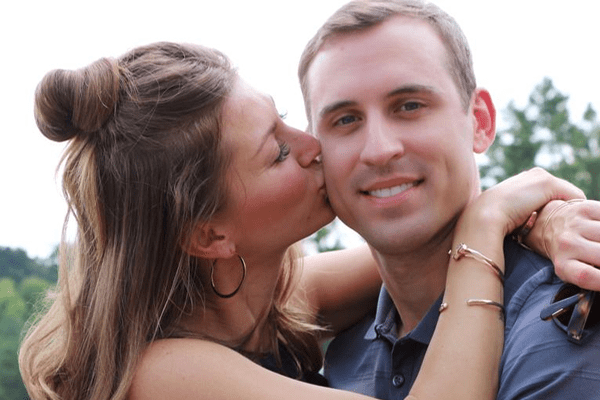 AshLee Frazier married to boyfrined Aaron Williams! midst all the divorce news in the Hollywood arena, it is amazing to see budding relationships. Long-time couple, Ashlee Frazier and Aaron Williams got married on Saturday, March 18, 2017! Congratulations are on the way for this hot power couple! Let’s dig into the details! The hot and gorgeous TV personality, AshLee Frazier who is known best for being a former The Bachelor contestant has finally tied the knot! In a glamorous ceremony held in Houston, Texas on Saturday, March 18, 2017, the power couple, Ashlee Frazier and Aaron Williams took their vows. 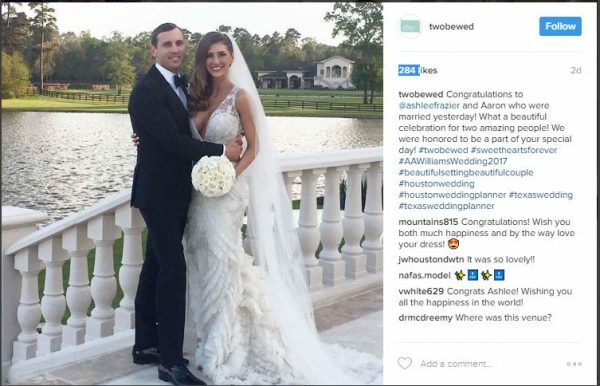 The wedding was held at groom Aaron Williams’ parent’s lake house overlooking the scenic Lake Conroe. Although the groom looked classic and handsome in his black suit and black bow tie, all eyes were on the gorgeous bride, Ashlee Frazier. She wore a floor-length veil and a beautiful lace gown from Ivory Bridal Atelier. The couples were joined by their loving family and friends when the wedding bells rang. @ashleefrazier ‘s beautiful wedding vows to Arron ?? AshLee Frazier although known best for her appearance in The Bachelor is also known for her appearance on ABC’s series Sean Lowe’s show and for being a lifestyle blogger. Aaron Williams is a real estate agent. Frazier revealed on November 7, 2016, to the US weekly that she had gotten engaged to her boyfriend after having a long dating affair. She told to the US weekly that she would be marrying her best friend Aaron “After a 10-year friendship and 11 months of courtship”. She also added that since Aaron proposed to her in New York, it will have a special place in her “heart”. Frazier also added that Aaron had popped the question while they were on the romantic and beautiful Brooklyn Bridge. At the time, the couple was on a vacation in New York. On her Instagram account, Fraizer posted a short video of the Brooklyn Bridge and captioned it, “Best walk. Best view. Forever in my heart!” and revealed to the world that she was getting married to her fiancé, Aaron Williams! The cute couple seems to be doing great in their professional careers as well as their personal life. Aaron Williams is doing well in his real estate work while Frazier is ever busy with her work as a TV personality. We hope the best for the newlyweds. Congratulations to Ashlee Frazier and Aaron Williams on getting married!